. 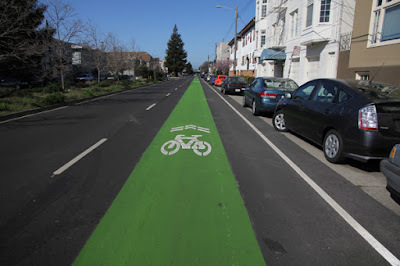 . . in 2009, the city of Long Beach received FHWA and CTCDC approval to experiment with a shared lane marking that is set within a 5’ green painted area at the midpoint of the roadway in the left-most and right-most lanes. 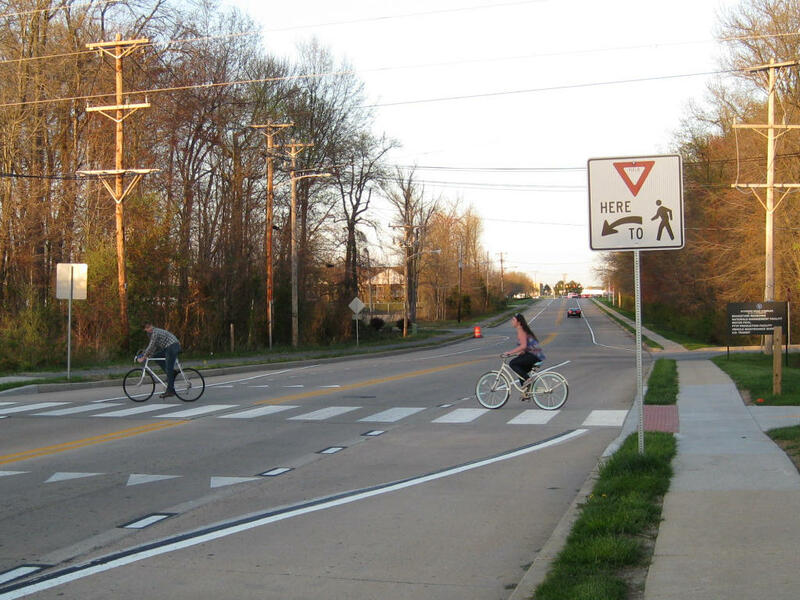 A study conducted as part of the experiment measured a 100% increase in cyclists and an improvement in bicyclist lateral position in the roadway. It is important that cities participate in these studies, in order for new infrastructure concepts to be adopted into National and State manuals as standard treatments. 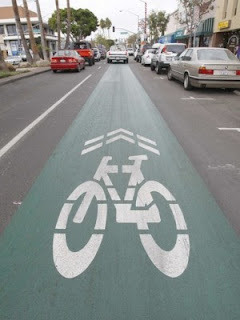 For example, in 2007, Ithaca NY was among several cities that participated in the use of Sharrows, and having them included in the 2009 MUTCD for the first time. Newark is moving forward with "Parkettes". It goes without saying that designating Main Street's right lane (clearly marked) for mixed use would only increase safety. 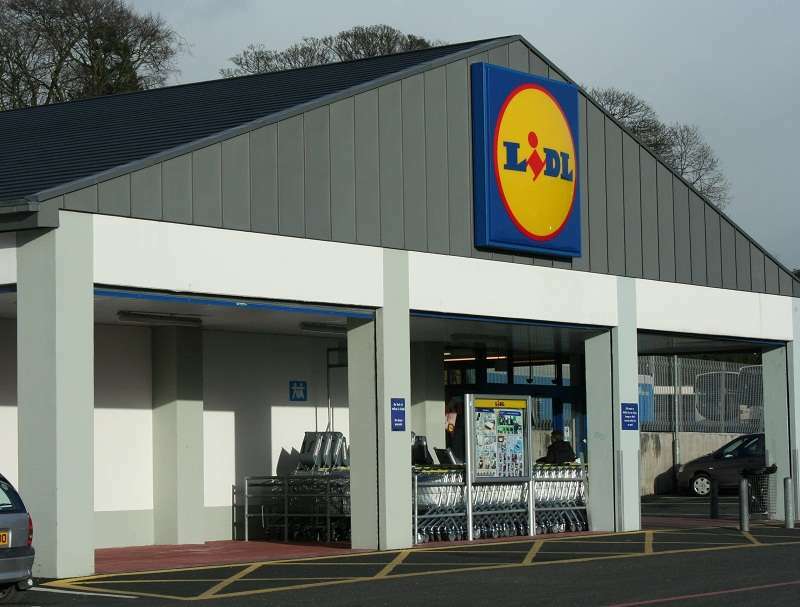 Sitting outside within the confines of a parking space, immediately adjacent to passing traffic will be a leap of faith for most people in the current environment. Though uncommon, parkettes have been struck by cars. It should also be noted that for many years, Newark officials (most notably Mayor Vance Funk) declared that they had a vision for a Main Street bike lane, even if it came at the expense of one side of car parking. Instead, we have businesses and city planners scrambling to add a parking garage. Though it has been strictly outlawed, most UD students and locals that bike Newark simply refuse to ride in Main Street's right lane in its current configuration (sharrows only). Aggressive and distracted driving are among the top reasons cited, and that's not about to change anytime soon. Conclusion: Though there would need a push, and some initial work involved, Newark has a unique opportunity to improve bicycle and (future) parkette safety on Main Street. They would encourage more folks to ride in the right lane where they belong. Mode share for non-motorized traffic would increase. The City would be participating in a national process to have shared green lane infrastructure nationally approved. They would be making due on their long promised Main Street bike lane, though a shared lane compromise (but one we could all embrace). It would be a great shame if Newark did not pursue this idea, and chose to commit this upcoming Pave & Rehab project with only Sharrows to show for it, for the duration of its life, which could be 15 years or more. 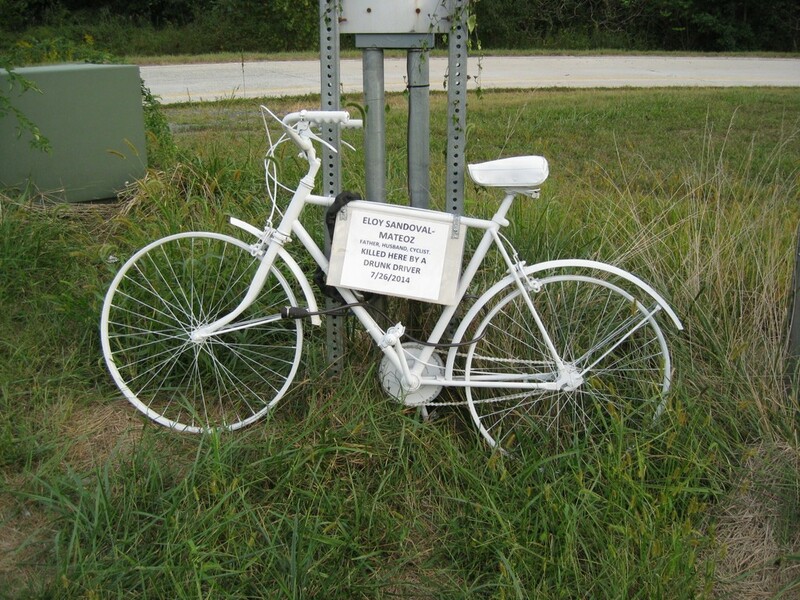 1st State Bikes followers demand update. We deliver. Seasons Greetings, Delaware Street Bicyclists, and Happy New Year 2017! 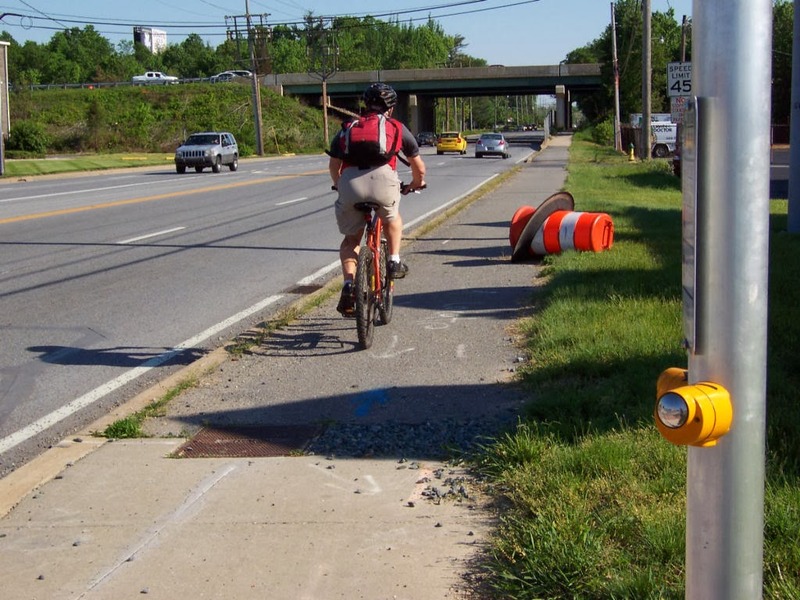 In the face of popular demand, it has been decided that we should add a post that reflects our ongoing bicycling and pedestrian (and more recently, land use) advocacy in the Greater Newark area since early 2015. 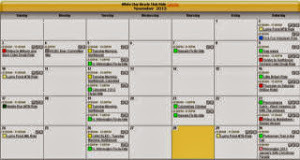 It's been a busy and productive time! Here are the projects that we at 1st State BIKES have taken active leads on, along with an update on their status. The Shared Right Turn-Only (RTO) Lane treatment is finally approved and being implemented. First was Limestone Rd through Pike Creek, followed by Kirkwood Hwy between Red Mill Rd and Saint James Church. The most recent is Route 4 between Newark and Stanton. These improvements are by no means a panacea, but they do increase safety and comfort for riders today that have no choice but to ride on arterial roads. They tell motorists to expect bicyclists on the roadway, and encourage respect and safer positioning when overtaking on the approach to intersections. Upon the request of advocates, DelDOT has agreed to use the treatment during pavement & rehabilitation projects, but also agreed to "retrofit" one existing corridor (not in need of repave) per year. Route 4 above was for 2016. 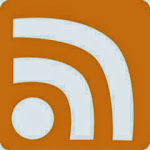 You can read past posts giving a history of the shared RTO treatment HERE. The Multi-Use Pathway running parallel to Route 72 (S. Chapel St) south from Newark will, apparently, be repaved/reconstructed sometime in 2017. 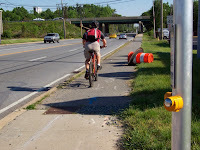 We only learned of this recently from the Newark Bicycle Committee's newsletter "Mailbag". Since 2003, rehab of this facility between Route 4 and Old Baltimore Pike was my personal priority, as evidenced by continuous postings in this blog. It began with DelDOT's Bicycle Coordinator Dave Petroski, followed by Joe Cantalupo, and lastly Anthony Aglio. For whatever reason, the last - despite many years working closely together - didn't see it fit to inform us, assuming it's true. We were caught completely off guard with a lane expansion project on eastbound Route 4, just east of Harmony Road in Ogletown. To the chagrin of motorists, thru-moving bicyclists must control of the inside of two RTO lanes before picking up the shoulder again east of Samoset Dr. A well designed parallel MUP was also included in the project, but cannot be reached without leaving the street and changing to a pedestrian. 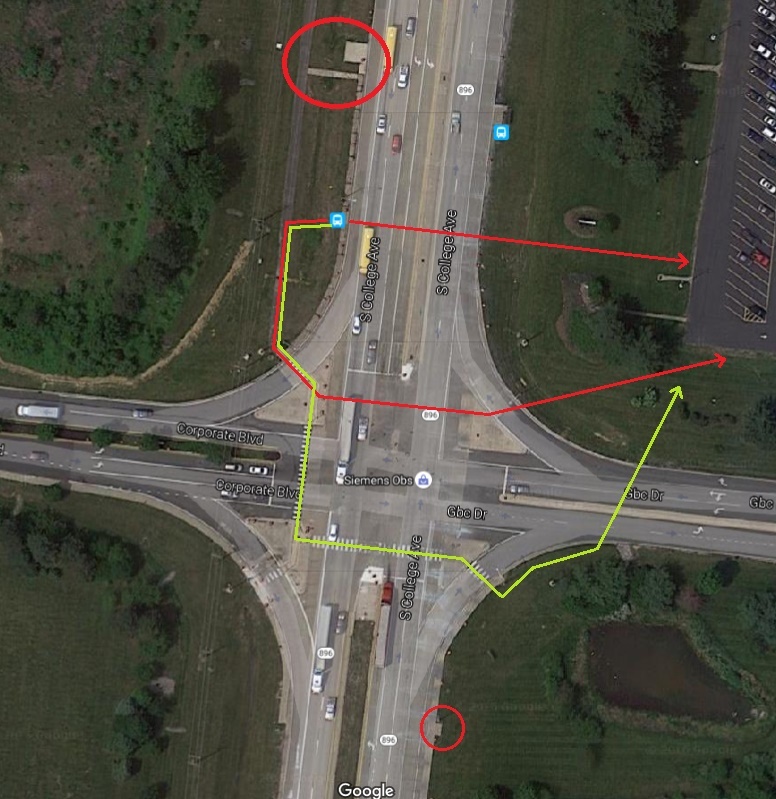 We continue to ask DelDOT to apply Sharrows in the inside RTO lane, or provide easy on/easy off ramp access to the MUP immediately east of Harmony Rd (at the onset of the outside RTO lane). As it stands now, this approx two block stretch is a bicyclist's worst nightmare. 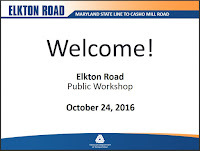 Based on a DelDOT working group's recommendation, they are planning to go ahead with lane expansion (3 lanes in each direction between Otts Chapel and Christina Pkwy) for the Elkton Rd Reconstruction Project, Phase 2. This, in addition to double RTO lanes at Christina Pkway. We do not believe that bike/ped/quality of life advocates were fairly represented in the group. The project does include a parallel MUP and bike lanes, but we are opposing the added 3rd lane. We simply can't solve congestion problems by turning every road into a Route 13 and every intersection into a Hares Corner. That is what our future could hold if DelDOT continues on its current trajectory. There is also induced demand, but most damning is the fact that a significant amount of Elkton Rd traffic is from motorists evading the I95 toll. 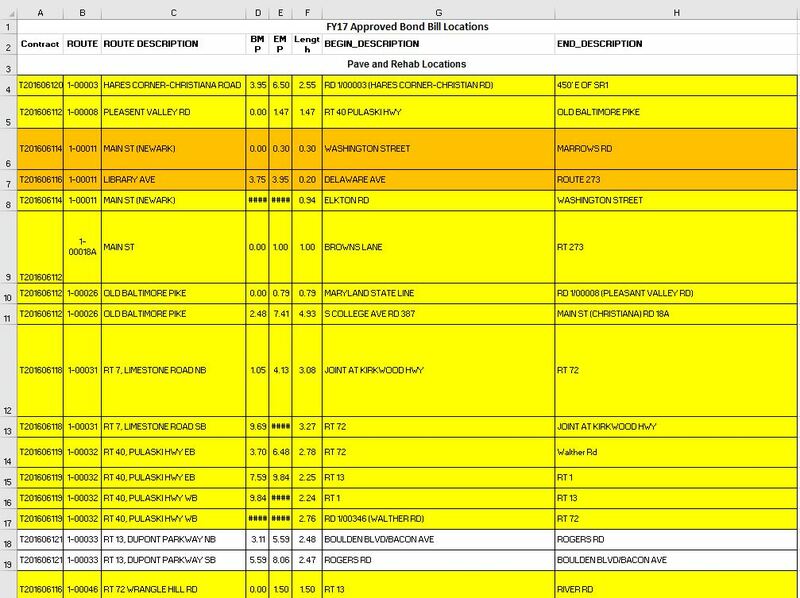 Projected demand out to 2030 supposedly calls for the added lanes, but we have strongly urged DelDOT - with Wilmapco in CC - not to spend the additional $5M added cost until studies have been conducted. We already know that the police stake out the area, and routinely prosecute commercial vehicles for toll evasion. Last year, Delaware was #1 in the nation for per-capita pedestrian fatalities, and to that end, an attempt is underway to reform Delaware's vehicle code. Known as the "Pedestrian Bill", it would be modeled after other progressive States such as WA, MA, OR, etc, bringing it up to date with modern times. As ours stands now, the language is almost totally car-centric, placing most of the onus on pedestrians not to get killed. It actually requires peds to be in the crosswalk before a yield is legally required, whereas other States only require intent to cross as a trigger. There are other issues as well, including an antiquated reference to Father's Day somehow influencing the law's enforcement. An upgrade here would be a monumental step in the right direction, and give pedestrians the confidence they need to use proper crosswalks where available. As members and constituents of the NCC Civic League, we will be looking to them for its first endorsement. A huge tip of the helmet goes to Amy Wilburn for spearheading this effort. 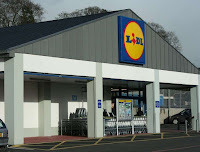 1st State Bikes is working with the region's first Lidl grocery store (expected construction in 2018) to become the model for bike/ped/transit-friendliness. Angela Connolly proudly accepted a position in their Community Working Group as an active transportation advocate. Originally, the company had committed to maintaining 70% of the property (now a 3-hole golf course) as dedicated open space. That could drop to 50% if the company decides to include a coffee shop and/or bakery (think Panera) in tandem with the grocery store. But no less than 50% will be set aside regardless. Angela is working very hard to ensure that both have state of the art (apbp approved) bike parking, an outdoor cafe', and site pathways and other important features centered around community building and place-making. Do you live in the area? Have your say with this quick 5-question project survey. A tip of the helmet to Angela for taking this on, and pursuing only the best for current and future Ogletown residents! 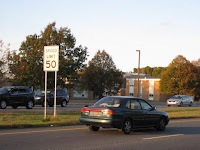 We have repeatedly asked DelDOT to lower the speed limit on Route 4 through Ogletown. Currently, it is 50 mph, with many driving well in excess. Sympathetic to our cause, Senator Karen Peterson requested that a speed study be conducted and the corridor be re-evaluated from a safety standpoint. It was found that the average speed was 53 mph. Considering the stop and go nature of Route 4, it takes many folks far exceeding the speed limit to create said average, and it shows. Unfortunately, to the average person, 3 mph over doesn't sound so bad. 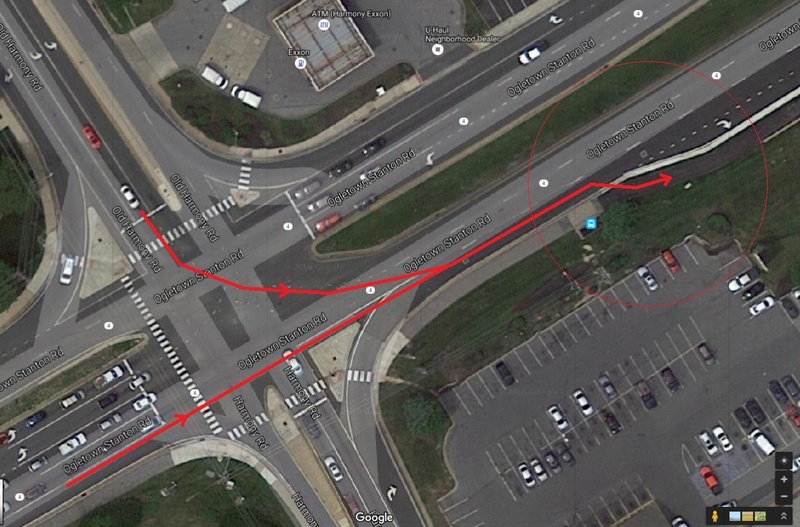 Unfortunately, despite several schools - including one for the deaf (where students can be seen walking the a adjacent pathway and crosswalks) - and multiple intersections and retail centers rich with bike/ped activity, DelDOT refuses to budge on this one - not even a drop to 45 mph. At issue is the "85th Percentile" , a method used to determine speed limits that is actually based on the assumption that most motorists are law abiding citizens (good drivers). consequences for bike/ped/transit users as well. Our vision is for the State and New Castle County to buy most of the property and add it to the park system. To that end, we created the community Facebook page "Save Ogletown Pond", with nearly 800 genuine likes and dedicated followers. Progress is at a standstill for now, given the holidays, but we expect the good news to come sometime in early 2017 (we hope). A park here would be the region's first, possibly modeled after Glasgow Park with all its amenities (pathways, pavilions, courts, bike parking, etc). November, two advocates from 1st State Bikes accepted positions on the Executive Board of the Coalition for Natural Stream Valleys. If you haven't already heard of this org, the CFNSV was the main advocacy force behind White Clay Creek SP, Middle Run Valley, the recently State acquired Deerfield Golf and Country club, etc. It consists of several legendary land use advocates, including Arabella Bianco, Richard DuPont and Donald Sharpe. The hope is to strengthen our alliances in the face of non-support from other bicycling-related orgs. We also see this as an opportunity to better position ourselves in the fight to Save Ogletown Pond (orphanage property). 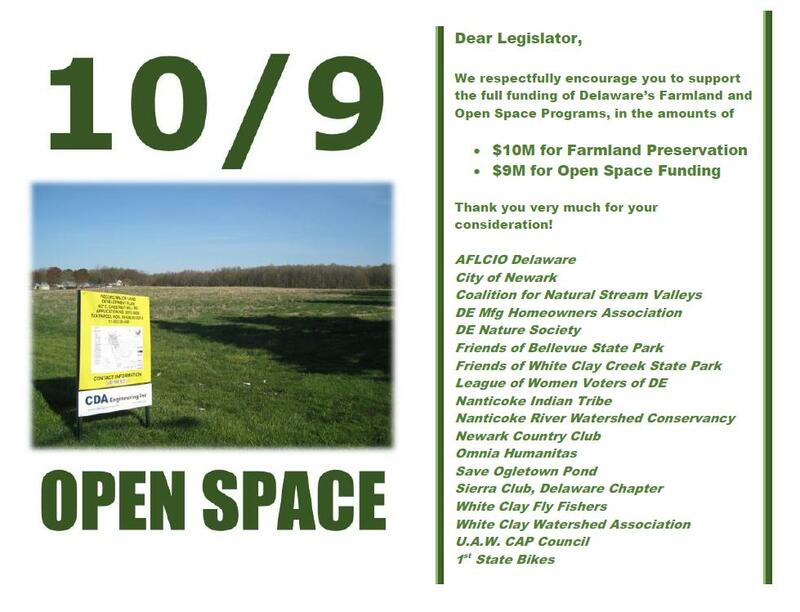 We already joined forces with the CFNSV back in April, in an unsuccessful attempt to have open space funding (originally legislated at $10M for farmland and $9M for open space) reinstated in the bond bill. 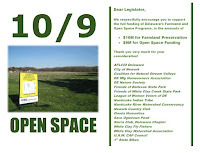 We also worked hard to convince the Democratic Party to include open space as a plank in their campaign platform, and are still waiting for their decision. If led, please visit and like their Facebook page! An opportunity to eliminate a dangerous crosswalk design with a pave & rehab project in Glasgow (across Route 896 at the jct of GBC Dr) appears to be lost. DART Bus Route 55 drops Siemens Healthcare transit commuters at a bus stop just north of the intersection. The existing crosswalk (to nowhere) crosses on the south side, and sees virtually no users because of the added time and steps involved. Rather than cross two legs of crosswalk and back again without one (3 legs total), commuters find it much simpler to run across 896 either from the bus stop or on the non-crosswalk side. Unfortunately, it wasn't until after the concrete was laid did we realize that no redesign was in the works. We informed both DelDOT and DART officials, and informed them of this rare opportunity to right a potentially deadly design flaw. DelDOT claims that they reached out to DART without a response, and DART claims no such actions were taken. It is not clear if DelDOT will consider moving the crosswalk to the north side - where it belongs - at this late stage of the rehab. We are still waiting for a formal decision one way or the other. As always, we continue to monitor pave & rehab projects for opportunities to improve multi-modal safety. 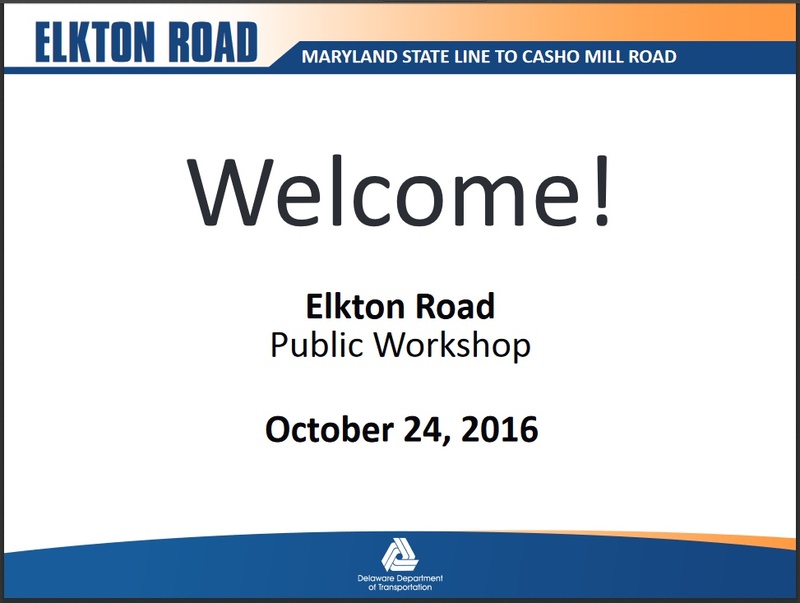 We asked for and won bike pocket lanes on Elkton Rd (between Newark and the MD line) with a recently completed interim repave project. 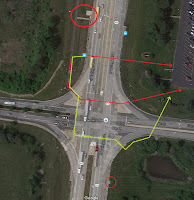 We have asked for shared RTO treatments (first item above) on Route 72/Sunset Lake Rd south of Newark, and believe DelDOT will come through for us with a repaving next year. Each year, more and more opportunities arise, within the confines of what can be achieved with a basic pave & rehab project (beyond that, it becomes capital reconstruction) and re-striping. It is up to road safety advocates to take the lead on this, in the face of refusal by our State's LAB sanctioned advocacy org. 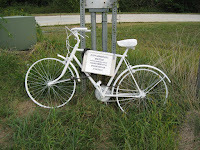 Finally, it is critically important that we monitor all car-bicycle crashes, and rally to the cause of bicycle safety. 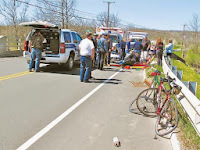 Only this way can we make the Vulnerable Road Users law an established penalty by the court, and draw attention to the price we all pay for reckless, aggressive, and or distracted driving. Sadly, again, our State's nationally sanctioned (and hugely popular) advocacy org had this to say regarding a high profile case in 2015: "We will announce the sentencing dates for [name withheld] but not actively promote "packing" the courtroom. Our position is that it's up to each cyclist to decide about the value of them personally attending". A lawyer named Oren Noah, one of the group's founding members, proposed a campaign similar to one that had been waged five years earlier in Marin County, after a rider named Cecily Krone—an occupational therapist who worked with handicapped children—was killed at 9:30 a.m. on a Sunday by a drunk driver searching for a cigarette. 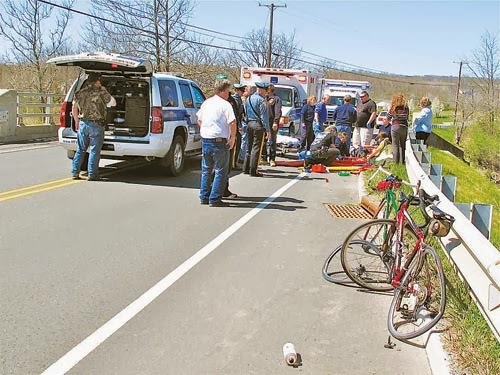 Cyclists packed county courtrooms at every hearing related to the case, and the driver was sentenced to six years in jail for vehicular manslaughter. Noah now suggested that Sonoma cyclists follow that example, not only to draw the attention of judges and the media, but also to show the perpetrators themselves "that they killed humans with friends and robbed from the community.... [and to] maintain the focus where it should be: on the drunk killers"